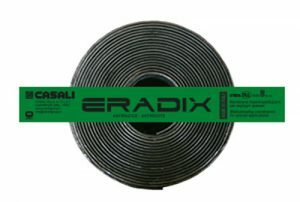 Casali Eradix provides a root-stop waterproofing finish as a multi-layer, torch-on system for waterproofing garden roofs, planter boxes or decks where vegetation comes in contact with the structure that requires protection. Eradix is reinforced with stabilised polyesters of different technical performances to create a barrier against the perforating action of roots guaranteed by the addition of a certified additive (complying with EN 13498). This membrane has high mechanical strength, a wide thermal operating range and is blended with a APP/SBS compound to reach the highest possible performance. When used, as part of a Green Roof, Waterproofing system, and this membrane will assist in the reduction of energy costs, and greenhouse emissions by providing reduced indoor temperatures and humidity conditions. This product is available in the following colours & finishes.